Here's a crowd pleaser of a dessert that is the perfect thing to make for your next party. They're VERY rich with chocolate, crunchy and nutty from the pecans, and sweet and gooey all at the same time! I made them for Tory and Ryan's house warming party and they were an instant hit. 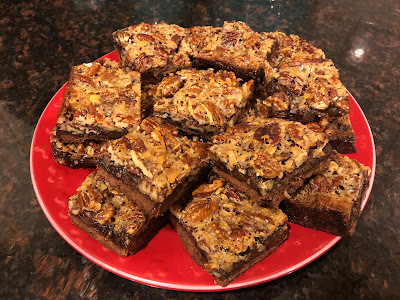 Ryan was the first to sample them (an immediate thumbs up), Gregg was a HUGE fan, Kelli said they were "Slammin'", and pretty much everyone wanted to know when I would be sharing the recipe! Well, everyone, here you go! The recipe is from a blog called Bake or Break, and it's pretty awesome. Make them for your next party and I promise you'll have everyone asking you for the recipe!! Arrange pecans in a single layer of a shallow baking pan. Bake 8-10 minutes or until lightly toasted. Stir halfway through baking. Line the bottom and sides of a 9″x 13″x 2″ baking pan with aluminum foil, leaving an overhang on two short sides. Grease foil. Whisk together the flour, confectioners’ sugar, and cocoa. Add the cold butter, and combine with a pastry blender until the mixture resembles coarse meal. Press the mixture into the bottom and about 3/4-inch up sides of prepared pan. Bake the crust for 15 minutes. Remove from oven and immediately sprinkle chocolate chips evenly over crust. Allow to cool on a wire rack at least 30 minutes. Place the eggs in a large mixing bowl, and beat lightly. Add the brown sugar, corn syrup, and melted butter. Whisk together until smooth. Stir in the coconut and pecans. Pour evenly over the partially baked crust. Bake 28-34 minutes, or until the edges are golden and the filling has set. Cool completely on a wire rack. Then, refrigerate for an hour. Using foil overhang, lift the bars from the pan and place on a cutting board. Use a sharp knife to cut into bars. I used a food processor to cut the butter into the flour mixture. It was SO much easier. I also used parchment paper instead of foil to line the pan. Either one will work!